After the gruesome bath salts “zombie” attack in Miami sky-rocketed this designer drug into the news, I felt compelled to address the dangers of using it. If the fact that you might end up eating someone’s face off doesn’t keep you from using this drug then consider some of the other affects: agitation, paranoia, hallucinations, chest pain, suicidality. Some users have committed suicide days after the affects of the drug have worn off. Why the name bath salts? It is a simple matter of distribution. Market them as bath salts and label them as not for human consumption and you are able to sell them legally, at least until the danger to public health forces the authorities to act. Bath salts contain various amphetamine-like (stimulants) chemicals, such as methylenedioxypyrovalerone (MPDV), mephedrone and pyrovalerone. They are taken by mouth, inhalation (snorting) or injection. The worse outcomes seem to come when snorting or injecting. The scary part of designer drugs is that the only concern of the chemist is that it works. There are no safety studies done as required by legal pharmaceuticals. So you could get high and do irreparable damage to your brain, liver, kidneys….you get the picture. If you know anything about users and abusers then you know that no matter what evidence is presented about the dangers of using a chemical, they will do it anyway. So, as a concerned parent, friend, whatever what can you do? Routine drug tests can’t detect bath salts. 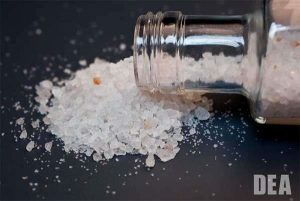 There is a new 21 panel drug test (tests for 21 different types of stimulants) available that can detect bath salts in the urine. These tests are constantly being updated in order to keep up with the designer drug chemists that are routinely altering their formulas. Have more questions? Contact us at 800 972 2054, We’ve Got Your Back!